DAVID GARRETT (ACT) : I have been invited by Labour to stand and state our position on this bill. I have to say that it is not easy to do, because there has been considerable debate among our party, among our supporters, and among our caucus, on our position on the Wanganui District Council (Prohibition of Gang Insignia) Bill—and for very good reason. I am afraid that as much as I like and respect my new colleague Mr Bridges, I cannot agree that it is a good bill. It is not a good bill for a number of reasons. It is not a good bill because it does not clearly define what gang insignia is. It is not a good bill because it does not spell out exactly which areas in the Wanganui District Council district can be designated as gang-free zones. Before continuing, I would like to take up Ms Turei’s point. I find it rather saddening to have to say, for about the fourth or fifth time I have spoken in this House after Ms Turei, that it would be very helpful if she actually read the bill that she was debating. She just stated that there is nothing in the bill that prevents the entire Wanganui District from being designated a specified place. I thought she had trained as a lawyer—I did so. If the member read clause 5(5), she would see that it specifically states: “A bylaw must not be made under subsection (1)(a) if the effect of the bylaw, either by itself or in conjunction with other bylaws made under subsection (1)(a), would be that all the public places in the district are specified places.” So there is one point that is completely incorrect, and it would be very, very helpful if those who were going to debate this would actually read the bill. The second point that Ms Turei made that I am afraid I must take issue with, and quite strongly—and I will explain why in a moment—is this absolute nonsense that the bill is aimed at Māori gangs. The bill specifically refers to a number of gangs, including Hell’s Angels, the Mothers, and the Magogs. During the adjournment week I was contacted by text by one Shagger Gilmour—he was stupid enough to write it—of the Magog Motorcycle Club. He made some fairly carefully veiled threats to me over speeches I had made on this bill earlier. Shagger is a senior member of the Magog Motorcycle Club, which, despite his claims to the contrary, is either entirely, or at least mostly, a white gang. He claimed, although he would not name who the member was, that a Māori had been a founder member for 32 years, and he suggested that I in fact knew nothing about it and had never been there. I named a few of the members and he went a bit quiet. Hell’s Angels is also wholly, or almost wholly, a white gang. So the claim that this bill is aimed at Māori gangs is absolute and utter nonsense. Perhaps Ms Turei, during her next call, may wish to refer to Rooter Johnson, Smasher Harris, or whoever is a Māori and a member of those named gangs. But I get on to the guts of the bill. As I said, I am afraid I cannot agree entirely with my colleague Mr Bridges, or, I am afraid, with my colleague Mr Borrows. There are a number of things wrong with the bill. It will not make a noticeable difference to the criminal activities of gangs. It will not, sadly, make much difference to their presence in Wanganui. I have to say, in all fairness, that I agree with the point made by Ms Mackey and others—and, again, I feel rather bad about having to say this—in relation to the killing of the young fellow with the wrongly coloured hoodie: the bill is likely to cause, and not to solve, that kind of confusion. The bill is a measure of the desperation of the Wanganui community. They have had enough. As a society we have been frozen in the headlights, like a possum or a deer, for 30 years, over what to do. Norm Kirk—well before Mr Hughes was born, I suspect—said he was going to take the bikes off the bikies. It did not happen, so we have had the problem since at least 1972. DAVID GARRETT (ACT) : I came to Parliament believing in the parliamentary process, that the executive did not, in fact—as the cynics say—dictate everything, and that the debate in this Chamber was actually meaningful. Since I have been here people both inside the Chamber and outside have laughed at that naivety and told me not to be silly, that I was right in the first place and it was all irrelevant, and that what happened here was all hot air and did not much matter. Well, who would have thought it? I have discovered that the Wanganui District Council (Prohibition of Gang Insignia) Bill has proved that the parliamentary process—and by the parliamentary process I mean this House—is relevant. I have been listening not just to this debate but to the earlier debates, and I have spoken in all of them, and sensible things are coming from almost all sides of the Chamber. There are lots of arguments both for and against this legislation that have merit. On one hand, the people of Wanganui have clearly indicated their desire for this bill—more than 65 percent of them—and that is worthy of respect. I believe that while I was absent from the Chamber someone told Mr Boscawen, my colleague, that we were the libertarian party. Well, we are not. We have a libertarian wing, but we are the party of choice, so we respect the choice of the people of Wanganui. We promote freedom of speech. Many in our party are almost obsessed, I will say, with freedom of speech, but freedom of speech has limits. People cannot yell “Fire!” in a crowded theatre. People cannot walk down the street with certain things on their T-shirts or they will be arrested. It has nothing to do with gangs. These groups—gangs, or whatever—are criminal organisations whose purpose is intimidation. Much of the recent debate has completely neglected the part of the bill that requires gangs to be identified as being criminal. But there are problems of interpretation. I am a lawyer. There are problems in defining “insignia” and problems in defining “display”. All of those things are there. We could spend all night on the pros and cons, and the yin and yang. Members opposite have—with fairness and justification—asked where we stand, because we have created a little confusion. In fact, I will take responsibility and say that I have created some. I said at the outset that we were going to listen to the debate. I am afraid I have to say that what Mr Borrows, whom I respect greatly, thought was the coup de grâce—the story of the young man killed because he wore a red hoodie—in fact deeply disturbs me, and I am afraid that in all conscience I have to say that what the Labour members have said about that issue rings true. So where does the ACT Party stand on this bill? Well, we stand right here. We are listening. It has been a very vigorous debate—probably not quite as vigorous as here— in our caucus and in our party. I am going to be honest and perhaps again prove my naivety and my newness, and say that much of what I have heard tonight from members opposite makes sense. Much of what I have heard from the National side has always made sense. So I wish to keep listening. I think our caucus wishes to keep listening and to discuss and debate what is being said, because the parliamentary process has proved itself in this debate not to be irrelevant, not to be hot air, and not to be controlled by an executive or someone else. Mr Chair and fellow members, our position is this: we will vote in favour of the bill at this Committee stage, but that does not presuppose that we will support the bill at its third reading. The only way we can continue to listen to the contributions from all sides is to vote in favour at this stage, and that is what we will do. John Tamihere - the new Apirana Ngata? John Tamihere is getting closer to the source of the crime problem than others. I disagreed earlier with the assertion that preventing crime starts at school and said it starts earlier - in the family planning clinic or at home. Tamihere is saying, in the maternity ward. JT seems to make some sense when he gets on his Maori solutions for Maori problems band-wagon, but I can't agree to separatism in the long run and just how long do these arrangements go for? I once rang his show and asked what happens to those Maori who don't want to come to his I'm-in-control-of-your-benefit-party? And he didn't have an answer. It relies on compulsion. The beneficiary agrees to the trust controlling their money or there is no money. Otherwise individuals will simply opt-out to avoid the paternalistic ministerings. It isn't unusual or difficult for Maori to up sticks and go elsewhere. Maori beneficiaries, in my experience, are a very mobile - or transient - group. Ever since Maori have received welfare, from the early days of the Old Age Pension,and later the Family Benefit, there have been attempts to control how the money was spent. Agents were appointed and later tribal committees formed. I am personally dubious about their merits. Perhaps because the approach ignores the central question of why benefits are needed in the first place. So David Garrett refused to cheer for Helen Clark. I can understand how he felt. I recall staying seated when John Banks got a standing ovation at an ACT conference. And staying away from another ACT conference because Tariana Turia was attending and I couldn't face the prospect of applauding her when I abhor her ideas. She, like Clark, can be admired for her steadfastedness, conviction and tenacity but I personally cannot separate the person from their ideas. And it's not as if Clark is retiring to climb mountains and tramp the hills, where she can do no further harm. I hope I would have had the presence of mind to stay seated as well. Hypocrisy is just too hard for some people to stomach. Along the bottom axis are US states. Their respective violent teen crime rates (left axis) and single parent rates (right axis) are then plotted showing a correlation. The rapid growth of single parent families is the result of state subsidy. Driver of crime? Welfare. Police Minister Annette King says the lowest murder statistics for a decade show New Zealand has not become a more dangerous place in which to live. Commenting on the crime statistics for the 2007 calendar year, Ms King said: “Time and time again, whenever there is a random cluster of murders, the doom merchants and people with political barrows to push claim our streets are no longer safe to walk in. Ms King said she is encouraged, however, that women are now reporting incidents of domestic violence in greater numbers. “It is becoming clearer that women now have sufficient confidence in the police to report incidents of domestic violence. “I believe that what we are seeing is a truer reflection of the level of violence against women in our society. The increased number of violent offences in the statistics is almost entirely driven --- 5810 out of 6252 extra offences --- by recorded family violence. I also believe and hope that the current ‘it’s not OK’ and similar campaigns will encourage women to continue coming forward,” she said. • The incidence of recorded crime has remained at roughly the same level as in 2006, and has actually reduced 0.5 percent on the basis of recorded offences per 10,000 population. • While the actual number of offences increased by about 2000 during the year, police resolved nearly 10,000 more cases than they did in 2006. Ms King said she particularly wanted to congratulate police generally for resolving 9539 more offences last year than they did in 2006. “This success can presumably be attributed to a number of factors, but I have no doubt that two of the principal ones are intelligence-led policing, and the extra police resources that have been put in place by the Labour-led Government through its confidence and supply agreement with New Zealand First. Well I just thought you could absorb that while we wait for Labour's release about the Crime Statistics released today. Somehow I don't think the response will be framed in such glowing terms. I will keep you posted. Update. Laughable. Labour wants the credit for the increase in violent crime. “In the last crime statistics family violence accounted for the entire increase in violent crime, and it was quite frankly sickening to hear National leader John Key trivialising the issue for purely political motives. John Key tried to relate the increase in violent crime to street crime and gangs and robberies and youth violence, instead of recognising the value of campaigns launched by Labour to encourage the reporting of family violence,” Clayton Cosgrove said. No, you have not come to the wrong blog. 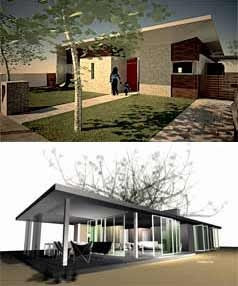 I was very proud of my youngest brother yesterday when he won the top award for low-cost housing design (featured left top). He came down from Auckland for the announcement, not yet knowing whether his entry was the winner from 148. In a happy coincidence it was Mum and Dad's 53rd wedding anniversary and we all got together for lunch in Oriental Bay. Stephen came to architecture relatively late. Messed about for a few years (lived) before finding his real interest, became a mature student and hasn't looked back. The Campbell Show featured a virtual model of his design last night. I was forewarned. At lunch he said to me, oh by the way, I used some of your art on the walls. "I didn't want to get sued." I was impressed. Good job, bro. nb. I should add that quite obviously we do not share the same politics:-) If I had time I might be able to convince him that the govt that is his friend today is turning on the same philosophy as the one that is the bane of his life every other day in the guise of thick building officers, exorbitant permit fees, delays, and general gross local government incompetency - all of which he could write a book about. The following are excerpts from last week's debate on the Gang Insignia Bill. I have been completely subjective and posted only the bits that made sense to me. ...Are we really passing legislation of this sort—and why? This is a classic example of the need to be seen to do something, as opposed to actually doing something that will actually address the issue. This measure is purely cosmetic. This is bravely running up to gang members, putting some lipstick on them, and saying they will look a lot nicer from now on and that because they look a lot nicer they will now behave a lot more nicely. This bill, I genuinely believe, will worsen the gang situation in Wanganui. This bill will provide a platform for a greater level of notoriety amongst a predominantly younger group of members who are attracted to the wilder side of life. They will now know, as a consequence of this bill, that it is cool, a rite of passage, and actually a measure of distinction, not just to the gangs but to the wider community, to poke one’s fingers at a stupid bill that will never be fully implemented. It will enrich legions of lawyers as they move away from the Treaty trough into the gang insignia trough. Unfortunately, it is not David Garrett who is the wally. Arguably I am a bigger wally because I helped get him voted into parliament. Update; There is apparently a later speech by David Garrett which is not at the Parliamentary website. DAVID GARRETT (ACT) : Before getting into the speech I have prepared on the Wanganui District Council (Prohibition of Gang Insignia) Bill, I will address some comments made by the previous speaker that were, frankly, just plain incorrect. I do not know what her knowledge of gang culture is—and I use that word “culture” in quotes—but I have visited a few headquarters in my time. When I was at the Magog Motorcycle Club clubhouse in New Plymouth some years ago, it was an all-white gang. The Mothers Motor-cycle Club of Palmerston North, I believe, does not permit Māori members. I do not think we would find a Māori member of the Hell’s Angels, either. They are all white gangs, and they are all targeted by this bill. There is not a focus on Māori gangs, and I dispute the member’s claim that in the public mind the word “gang” is synonymous with Māori gang. That may be some people’s view, but anyone who knows a bit about them knows that claim is simply incorrect. I will ask for indulgence at the start if my pronunciation is not perfect, but tā moko, as I understand it, has absolutely nothing to do with a clenched fist tattooed on the side of someone’s face, or with a barking dog with a spiked collar and a German helmet. These are the sorts of tattoos we are talking about. They are not the koru on the planes of Air New Zealand, but deliberately intimidating tattoos that are designed to put people off and to frighten them. I am rising to speak on this bill and to support it. I would like first, if I may, to pay tribute to the sponsor of this bill, Chester Borrows. As more senior members of this House will be aware, ACT voted against this bill at its first reading last year. We did so not because we supported gangs but because of a concern that innocent New Zealanders could be caught up in its provisions. I must say that I think Ms Turei makes a very valid point, unfortunately. I do not mean that sarcastically against her, but the removal of patches per se may well cause confusion, and difficulties with scarves wrapped around hands and with the other kinds of tags that are used by these clowns. If only they were clowns. ACT was originally concerned that legitimate motorcycle enthusiasts, youth groups, and even church members could fall foul of this law, and so voted against it. Following the passage of the bill through the select committee process, Mr Borrows has sought our support for this bill, and has addressed many of our concerns. One point needs to be made again very clearly, and on this I think I may differ from my colleague sitting in front of me, the Hon Tariana Turia. I guess by definition I am now referring to ethnic gangs. Gangs are not whānau. They are not clubs. They are not family substitutes. They are criminal organisations. They are methamphetamine-dealing, thieving, car-breaking, intimidating groups of people. That is what they are. They are criminals. They should, in fact, be illegal, but it seems to be too difficult for us to make them illegal. This is a good second step. It will target those who wear gang insignia, offensive gang patches, and other things, so I am happy to stand here today and to support the bill on behalf of my colleagues. At the first reading the Hon Rodney Hide, who is now the Minister of Local Government, said correctly that this bill will not solve the problem of gangs. I think that anyone who thinks it could solve that problem would be incredibly naive. 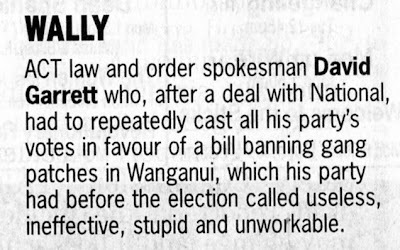 Indeed, the bill acknowledges in its explanatory note that it will not even solve the gang problem in Wanganui. But it will give, as Chester Borrows said, the police and local authorities more power to deal with this problem. It is another tool. It is pleasing to see that the Law and Order Committee resisted the advice it received and opted to retain a schedule of gangs that will be targeted by the bill. Those are mainly the Mongrel Mob, Black Power, Hell’s Angels, Nomads, Tribesmen, Magogs, and the Mothers Motor-cycle Club. As I noted at the beginning of my speech, at least three of those gangs are, or at least were, exclusively white gangs. The lowering of the maximum fine is also important. Since this Parliament began last December we have heard time and time again the figure of $700 million - odd in unpaid fines. Lowering the fine may make collection more manageable. Personally I would like to see a return to the days of a fine or, in default, 28 days in jail, but those are very unfashionable provisions these days. The next amendment recommended by the Law and Order Committee, which I am sure will please the Minister of Local Government, is the inclusion of a new clause 9, which makes the police the sole enforcement agency under this legislation. That is very important. Gang members by their nature are more likely than the average New Zealander to be carrying a weapon and to engage in criminal activity. Council staff are simply not trained to deal in such a way with gang members, who often congregate in large groups. In my view council staff are in the same situation as our country’s fisheries officers—putting their lives on the line to keep the rule of law with little or no training or means to protect themselves. Increasingly, we see fisheries officers targeted and exposed to violence in their job. Again, I thank Chester Borrows for his willingness to engage with ACT members, to respond to our concerns, and to talk to us about why he thinks this bill is a good idea. It will not solve all the problems. Other measures are required, including the “three strikes and you’re out” bill, which is at present before the Law and Order Committee. I welcome Chester Borrows’ commitment to me to listen with an open mind to the reasons behind the “three strikes” legislation, and to give it his support along with the support of his fellow members if he can be convinced that it is, in fact, a good idea, and that many of the alarmist claims about that bill are simply without foundation. That legislation, if passed, will ensure that gang members, who are often among the worst recidivist and violent offenders, will be locked up for longer. It will ensure that criminals like Antonie Ronnie Dixon and William Bell will not walk our streets to kill again. We will not have any more William Bells. No one will get the chance to get 102 convictions before graduating to killer status. That bill will ensure that decent New Zealand families are spared the anguish of losing a loved one to a paroled killer. Legislation passed by this Government on the “three strikes” policy—hopefully—on DNA sampling, and on this ban of gang patches, at least at this local level, will go some way toward keeping New Zealanders safe, which everyone in this House claims to be very keen on, and one would hope that they were. I commend this bill to the House, and I will support it on behalf of the ACT Party. A surge in child abuse cases has been recorded at Starship Children's Hospital. Ministry of Health child and youth health chief adviser Pat Tuohy said the high numbers of recent child abuse cases were very concerning. "It's hard to know if it's a statistical blip but certainly if it continues it means what we're doing isn't working." Which raises the question, WHAT isn't working? Perhaps he is referring to the endless anti-violence TV advertisements that deeply upset many but go over the head of the ones it is aimed at? The legislative changes that were intended to send a message that hitting (and smacking for that matter) are not OK? The collaborative inter-agency systems for reporting and addressing abuse? The war on drugs and under-age alcohol consumption? The hiring of 8 teenage parent supervisors for the entire country? The political disassembling of two parent families? The active all-but abolition of adoption? One thing I am sure he isn't talking about is the continuing practice of encouraging unwanted births with relatively generous welfare payments.